It’s Day 2 of our 12 Days of Christmas Gift Guide and the RockSox Reverb tops our list today, and with good reason. Dropper posts may seem like an expensive, frilly indulgence, but they are nothing less than a necessity and the Reverb has proven one of our favorites over the years–it’s durable, consistent and just keeps on impressing us. So let’s start with the obvious point of distinction, the Reverb eschews cables for hydraulic fluid. The upside here is that the actuation at the lever never degrades and gets gritty the way cable-actuated posts do once contaminants inevitably infiltrate the cable housing. Of course, the use of fluid means you have to bleed the Reverb, which probably doesn’t stoke a whole lot of people, but bleeding the Reverb is a cinch (RockShox has plenty of instructional service videos online to help you get up to snuff on the process). If my mother-in-law can do it, so can you. Really. And, yes, I made my mother-in-law bleed my post. She has to earn her keep, dammit. Maintenance on the post? Uh…. In my three years of riding a Reverb I have done nothing other than bleed it annually. The other 300-odd days of the year, I slather the thing with mud and subjugate it to my every whim. I live in the Pacific Northwest–a place that normally lays the pimp hand down on pricey components, but which hasn’t broken my Reverb yet. RockShox outfits the Reverb with seal technology borrowed from their forks; and suspension forks basically spend their lives pogoing about in filth, so you can get an idea of how robust the Reberb’s seals are. Dropper posts tend to come in two basic flavors: infinite-travel models, such as the Reverb and 3-position models that offer you a very low “descend” position, a middle “I still want to pedal, but I don’t want my center of gravity up in the clouds” and a third full-extension position for those moments when you are suffering on a climb and you just need all the leverage you can get. Those three positions sound grand, but once you’ve tried an infinite travel post like the Reverb, there’s no going back to just three positions. Push the Reverb’s swank MMX handlebar-mounted actuation lever and you can set the post anywhere you like in its four to five inches of adjustability (the basic Reverb is available in either 100 or 125 millimeter-travel options). It’s a beautiful thing. Finally, if you want to speed up or slow down the Reverb’s up-and-down action, you can dial it to your liking with a twist of the “slap and tickle” adjuster knob on the MMX remote. On that note, the Reverb is available in 100 and 125-millimeter travel versions and 30.9, 31.6 and 34.9-millimeter seatpost diameters. If you own a frame that has internal dropper-post routing, you can also step up to the Reverb Stealth ($455), which allows you to route the house through your frame. The Stealth model also comes in three travel options (100, 125 and 150 millimeters). 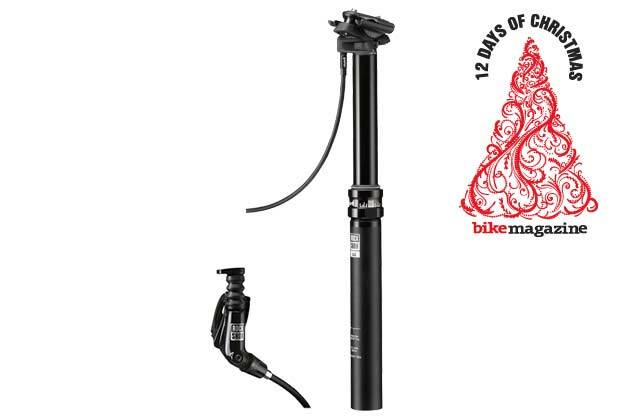 For more info on the RockShox Reverb, CLICK HERE.